A vacuum is something many of us need on the jobsite and some jobsites even demand them. The problem is, they take up so much room in the truck to be only used a few times a day. I say, the more room for the tools that make you money, the better. 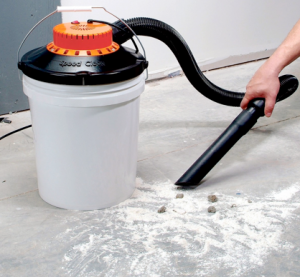 SpeedClean has come up with a vacuum that is absolutely genius. It uses a standard 5 gallon bucket that many of us already own, or can be found for free on the jobsites, as the storage for all of your debris. It attaches directly to the bucket without any need for seals or gaskets, which makes it easy to switch out buckets when one is full. The BucketVac is also a wet vac; so when your bucket is full, you can attach a lid and throw the whole thing away without worrying about any spills. SpeedClean says the BucketVac will be available Q4 of this year. No word on Price.